The performance and build rise above any niche concept and it could be an instrument you keep returning to both at home and away, albeit something you may treasure too much to risk denting at that campfire sing-along. Yamaha’s design skills show in a rich, surprisingly full-bodied sound from compact proportions. Some players heading for the stage may demand onboard EQ/level control. The rise of the compact travel acoustic has been surprisingly meteoric. The two dominant American makers, Taylor and Martin, have recently enjoyed huge hits in the burgeoning market for small acoustics. For Martin, Ed Sheeran’s preference for its diminutive LX1E ‘Little Martin’ meant the company could barely keep up with demand in the wake of his commercial breakthrough. He’s had three signature models since. Meanwhile, the success of Taylor’s trailblazing Big Baby concept led to the development of its GS Mini auditorium guitar under the design vision of luthier Andy Powers. Launched in 2011, it defied expectations about how big a small guitar can sound and met with huge commercial success. Not wishing to be left out of the party, Yamaha has now entered the ring with its own take on the genre. Yamaha has made models that could be termed as ‘travel guitars’ in the past with the APXT2 cutaway and JR mini folk series, but those were three-quarter size guitars, with 579mm (22.8-inch) and 538.5mm (21.2-inch) scale lengths, and seemed meant for smaller hands. Now, the return of Yamaha’s CSF series after 15 years marks its most determined move yet into the compact acoustic market, but it’s telling that despite the marketing images of campfires and tents, the ‘travel guitar’ phrase isn’t mentioned, with the description instead being ‘compact folk guitar’. Its scale is 600mm (23.6 inches) and the notion of a guitar that could occupy middle ground in the Yamaha line emerges. So does the idea succeed in practice? The original CSFs predated the modern resurgence of parlour-sized models, and the Tobacco Burst gloss finish here is a reflection of one offered on that original run. There’s a natural option available, but this ’burst sets the design apart here from the satin finishes often seen in the compact acoustic market. The attractive combination of the cloudy gloss hues and minimal but effective abalone rosette on the body, with the practical comfort of a satin neck is very well-considered. This isn’t the slimmest of necks, compared to some of its rivals in the compact acoustic market, but we think that’s a strength - and the 406mm (16-inch) fretboard radius will be welcome news for anyone alienated by the more cramped playing experience of some so-called travel guitars. A rosewood ’board is also a welcome feature on a mid-priced model, post-CITES regulations. 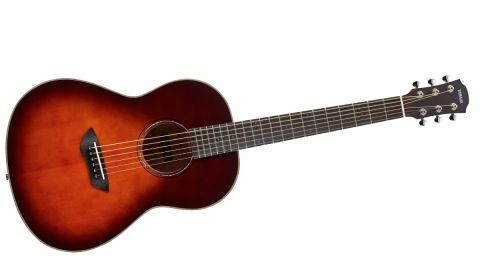 Like many of Yamaha’s current builds, the CSF3M features scalloped bracing with the aim of producing a “louder, richer acoustic sound” but that’s not the only spec feature that could be to its advantage on paper; the 105mm body depth is deeper than most of the compact competition, but strikes a comfortable balance with the neck dimensions in play. And, as we soon discover, that equilibrium is well reflected in the tonal character of the guitar, too. If your past experience of compact travel-friendly, or indeed parlour-sized guitars, has been characterised by sounds on the boxy and compressed side with mid-heavy response, this guitar will be quite a surprise. Its voice is strong with a rich bottom end that’s immediately rewarding for fingerstyle bass notes. The sinewy high end makes for a great definition in choppy folk rhythm work with surprisingly powerful projection on single notes, while the satisfying neck dimensions also help to mask the sense this is a scaled-down instrument in terms of its playability. Both this solid mahogany CSF and the cheaper laminate CSF1M feature another unusual feature for travel-size guitars: passive piezo pickups. In terms of ease of use, the company’s SRT system is as streamlined as it gets with input through the strap button and no onboard controls. So, there’s no bells or whistles but the outcome is impressive. The CSF3M’s full and open sound is very well represented through our acoustic combo with the amp’s EQ set flat. There’s no hint of any plasticky piezo ‘quack’ here. Instead its low-end qualities give it a much truer electro sound, compared to its unplugged acoustic voice, than you’d expect. Players may want to dial back a little bass, especially for fingerstyle, which will require external EQ via a preamp pedal, amp or sound engineer. Also unsurprisingly, the output here is significantly lower than an active system. But overall the guitar delivers the goods where it matters. The CSF3M walks the line between a standard parlour and a lightweight compact traveller in both specification and feel, and it does so confidently. The design choices in neck shape, fingerboard radius, body depth and bracing add up to an instrument with impressive projection and bottom end that’s distinct in an ever-expanding market, and potentially a very usable guitar for many different players.